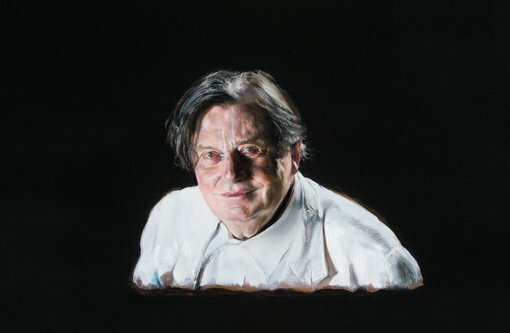 Melbourne artist Louise Hearman has won the 2016 Archibald Prize with her hyper-real portrait of iconic Australian Barry Humphries. Painting entertainer, satirist, artist and Dadaist, Barry Humphries, this is the first time Hearman has been a finalist in the country’s most famous prize. Best known for his alter-ego Dame Edna Everage, among other comic characters including Sir Les Patterson and Sandy Stone, Barry Humphries is a perennial favourite sitter for the Archibald Prize, this being his sixth time. His first appearance in the Archibald Prize was in 1969 as Dame Edna Everage. “I’m the happiest girl in the world right now!” Hearman said as she received the call this morning from Art Gallery of New South Wales director Michael Brand. “I have admired Barry Humphries since I was a young girl, and I’m thrilled for him too,” Hearman said. Titled Barry , Hearman’s oil on Masonite portrait represents the artist’s enduring admiration of Humphries. “That genius is now an international superstar. For years I had hoped that one day this frighteningly brilliant individual, who also paints, would see a show of mine when he was in Melbourne and like my work. “As it happened we became friends through mutual acquaintances and, much to my delight, Barry agreed to sit for a portrait. I tried many ideas, but as it progressed, the painting itself showed me the way,” Hearman said. The Archibald Prize winner is decided by the Gallery’s board of trustees. The trust’s vice president, Mark Nelson, said the judging had taken a considerable amount of time. “There was much deliberation and many worthwhile Archibald contenders, but Louise Hearman’s portrait took centre-stage in the end. It stood out as a portrait that truly captured the spirit of the sitter – she has caught Barry’s sardonic smile brilliantly,” commented Nelson. Fred Ohlsson, Group Executive, ANZ Australia was one of the first people to congratulate Hearman on winning the Archibald Prize. “ANZ congratulates Louise Hearman, the winner of the 2016 Archibald Prize. ANZ is proud of our commitment to the arts and community in New South Wales and we are delighted to support Australia’s most prestigious award for the seventh consecutive year,” Ohlsson commented. Five sisters from the Ken family – Tjungkara Ken, Yaritji Young, Freda Brady, Maringka Tunkin and Sandra Ken – who live in the remote Aboriginal community of Amata in the Anangu Pitjantjatjara Yankunytjatjara Lands, have won the 2016 Wynne Prize. Their collaborative canvas is a ‘seven sisters’ story about family protecting and teaching each other. “We are very proud to see our painting here in Sydney and to win the Wynne Prize. I am happy to be here with my sisters and for my family in Amata to see our painting win this big award,” said Tjungkara Ken. Esther Stewart is the winner of the 2016 Sulman Prize for her painting Flatland dreaming . Taking its title from an Edwin Abbott’s 19th-century novel that drew comparison between dimensional geometry and Victorian social mores, the painting considers domestic spaces through the dimensions of abstraction and minimalism. “Winning the Sir John Sulman Prize is an incredible honour and I am extremely delighted,” said Stewart. Of the 51 finalists in this year’s Archibald Prize 25 were women artists. One artist, Lucy Culliton, has taken out the finalist-trifecta with works in each of the Archibald, Wynne and Sulman Prizes. Art Gallery of New South Wales director Michael Brand said this is the first time that all three prizes have been won by women artists only. This year’s Trustees Watercolour Prize goes to Leah Bullen for her work Conservatory no 2 . The Packing Room Prize, announced last week, was also awarded to a woman artist and first-time Archibald finalist, Betina Fauvel-Ogden, for her portrait of George Calombaris. “It’s a great day for Australian women artists and the success of Louise Hearman, the Ken Sisters and Esther Stewart will be celebrated not just at the Art Gallery of New South Wales today but right around the country,” Brand said. Already, during the past week, for example people from Armata all the way to Sydney have been wishing the Ken Sisters well,” he added.